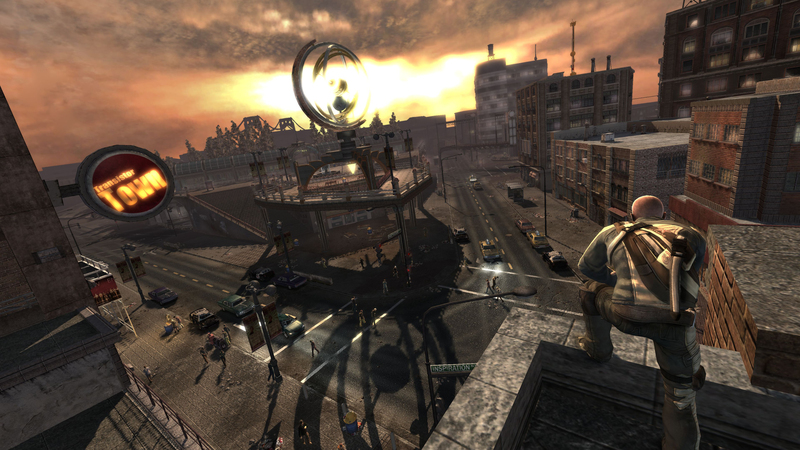 I would place the introduction of inFamous as one of the better opening levels in open world gaming. I say this because it sets the stage to not just for the game, but also more importantly for the milieu. Milieu is the French word for environment or setting, but it means more in literary theory and in stories where it is about creating an evocative setting as much or more so than characters, it is treated as a major character. It becomes as important if not more important than those whom the story follows. 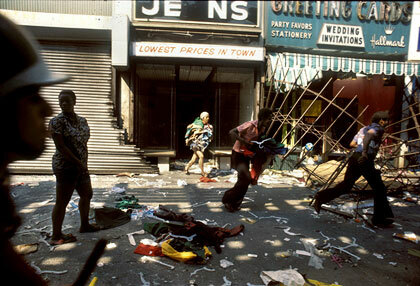 We see the explosion and then experience ground zero. It is a tutorial of the platforming, but at the same time it creates a sense of place. We are in a parking garage, now destroyed and crumbling. A metaphor for what will befall the city, both physically and societal. Then the next cinematic paints a picture of a pure Thomas Hobbes style society arising from the isolation and the destructive factions making a grab for power. Life becomes nasty, brutish and short. The first two missions further emphasize this by placing you in a context where you are fighting for survival. Both the mad dash to the food drop and then the desperate attempt to escape the island show the effects the breakdown of society have had. These two missions give the impression of desperation and need. It was these moments that sucked me into the world of inFamous. I could put aside the floaty controls and the imprecise fighting mechanics. Despite what happens after those two missions in regards to milieu I still felt a connection to whatever dim representation of the setting remained. The game from the end of the second mission onward does all it can to undermine its own setting. There are too many structural inconsistencies that I constantly see. Only when enemies show up and start shooting does panic break out. There isn’t even a subdued panic from people of having their world turned upside down. The citizens are not used to this world, why would they act calm and collected in the face of starvation, plague and death. They wander about blissfully down the sidewalk as if nothing is wrong and their tax returns are already in the mail. Even when enemies do show up the citizens don’t always behave accordingly. They will run in a panic to get away, towards the firing gangs. They will antagonize them by throwing rocks at the machine gun and shotgun toting bad guys. I was promised a closed off, fish out of water refugee like city and I get a New York surrogate with a convenient reason I can’t take the Holland Tunnel out of there. Given the intro, none of these make any sense. Cole outright told us all law and order was shot, gangs had risen up and installed anarchy. People were being killed and raped left and right. No one was allowed in or out of the city, enforced by a military blockade. Why aren’t the police effectively another gang, but instead going about business as usual? Where is all the gasoline coming from, because it doesn’t seem to have run out after two weeks? This is for both the cars and portable generators. Plus who would waste it on a car in the first place? Speaking of which, where was the city’s power grid getting its fuel? If there is so much crime, killings, rapes and perpetual darkness, then why are people out and about? Shouldn’t they be holed up in their houses most of the time? Why are people excited about the trains running when they can’t go anywhere? I can excuse the generators since their ludic and narrative purposes are too intrinsic, but at least give us perpetual rolling blackouts. I felt unease and minor terror when I wandered into areas where they didn’t have electricity yet, because it was dangerous for Cole. Once the power was up and running there was no threat anymore to the avatar or to any of the story elements. You can only feel society’s fear and unease if at points you feel it yourself because of how it affects your avatar in the game world. As long as there was a light switch around, I never felt threatened. The few moments where the game seems to know what it should be doing with its milieu are undoubtedly the best of the game. As I said before the opening is pitch perfect, additionally the introduction of each new island presents a sense of terror of the unknown and of unrelenting chaos. When you stepped out of the tunnel or made it over the bridge you get that sense of dread. The lights you worked so hard to restore are gone; you are at ground level and are being shot at before you can even get your bearings. For a fleeting instant you ask yourself, what have these people been going through while I was fixing the other island? A third point was a mission where you protect the engineers who are fixing the bridge between the first and second island. You actually feel like you are making a difference and getting things back to normal. Everything else seems superficial compared to this mission because squads of the Reapers and Dustmen trying to stop you for it would affect their territorial control. Finally the side mission called Gang War simply for unleashing a level of chaos on the screen that you don’t see anywhere else in the game. It was so volatile I could not see what I was shooting and may have only done half the work as the two gangs proceeded to kill each other. These instances reinforced the degradation of society promised by the game. Empire city is presented as such an important place and in the need of a superhero. The city was hurting and it was up to us to try and put it right. That was the most interesting part of the game: the restoration of society from chaos. The story, villains, and conspiracy were passable, being primed from a comic book aesthetic. I have no problem with the comic book aesthetic, but the intrinsic promise- the set of rules the beginning of a creative work puts down that are the core of the experience that creative work intends to deliver- is betrayed and not lived up to by taking it’s cue from the wrong comic book. It tries to copy the structure of Spiderman when it should have looked to the world building of Brain Wood’s DMZ. 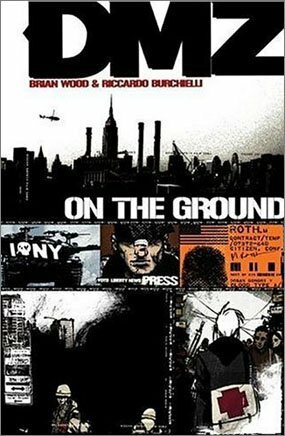 At the time I was playing infamous I was coincidentally reading Brain Wood’s DMZ, the comic series where new American civil war has turned Manhattan into a DMZ (Demilitarized Zone). No one is allowed out and only specific people let in, like the main character Matty Roth as an embedded journalist. Gangs have carved out territory for themselves, these new nations measured in blocks. Electricity is only accessible for an hour a day and only from certain buildings. The island is stratified with no one daring to go pastÂ Â st street. The two setups are too similar for no one to have not noticed. It wouldn’t have been hard to slightly adjust certain things for the presence of super humans. In fact doing so merely exacerbates the conflict already there. It becomes a test of wills only with the strength to back it up contained not within numbers, but individuals. The similarities continue into the details. The two news organizations in DMZ and inFamous are practically identical, both have become docile mouthpieces of the government and not based off of stupidity and laziness like in real life, but stooges that understand where the power is. Then there is the opposing mouthpiece that pretty much exists to counter the “legitimate” news program. Both Matty’s girlfriend from DMZ and Cole’s from inFamous are medical professionals in training. In DMZ this is used to give Matty and the reader a glimpse into the unsanitary conditions and hardships of the people. InFamous uses it to suggest and imply what DMZ shows and represents. Power struggles are a common theme of the two works, both on the inside and influences from the outside. Rooftop living arrangements become necessary, because street level is no longer safe. Though the rooftops aren’t used as much by inFamous’ citizens. But then I’ve already told you they have as much survival instinct as a suicidal tightrope walker. I am not saying inFamous should have been DMZ. That is stepping beyond my realm as a critic, but I am going to point out the faults of one work, especially in light of someone else doing it better in another. It’s even more a missed opportunity since inFamous apes the comic book aesthetic and DMZ is, wow, a comic book. 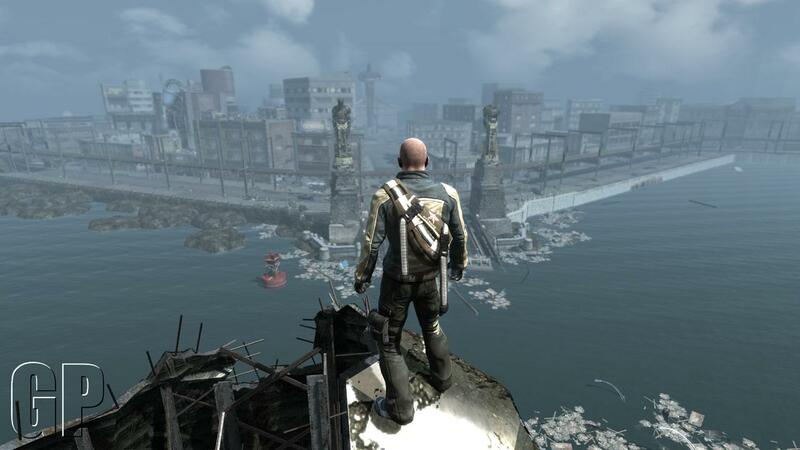 InFamous takes too many of its conventions from the wrong sources. It sets up the bad guys and the controllers of chaos and anything bad can be traced to them. Everyone else is a non-entity with no sense of survival instinct or power. Somehow there are no “little” bad guys trying to scrape their tiny slice of the pie when the main psychic villains fall. 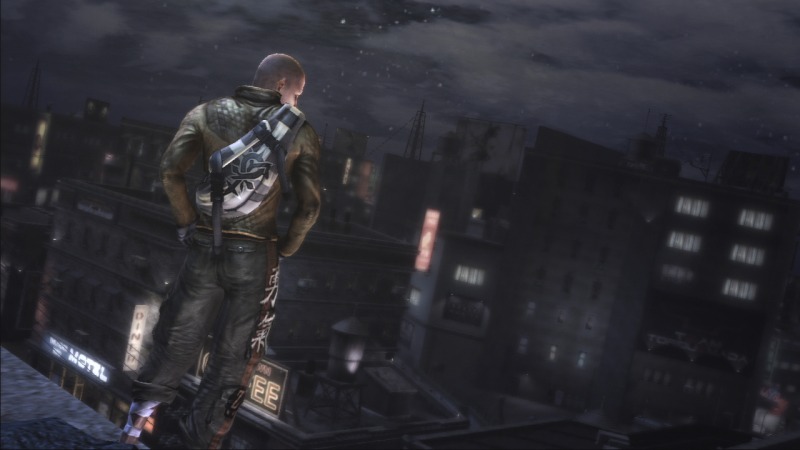 InFamous sees itself as a superhero story in a metropolis turned Wild West town, sort of. When really it’s a story of a DMZ (both comic and real world) setting where super powered humans have arisen. They looked to Spiderman, X-Men and the rest of Marvel’s cannon when they should have looked to Brain Wood’s work, Escape from New York and hell the real-life New York blackout of ’77. The game was a missed opportunity and given the game’s ending I get the feeling the sequel will have a different milieu, even if it takes place in Empire City. It seems like the designers didn’t quite get what made me want to keep playing the game. It wasn’t the side missions, or the characters, good lord no. It was the city itself and the what-if the game presented about society, which doesn’t seem too much like a what-if anymore. 3 Responses to "The Milieu of inFamous"
This is a fine critique on, what I believe, a good game that has been mistreated by rigmaroles and unauthentic design choices of what a world that has been ravaged by schism and isolation should be like. There are times where I felt that the only way to go through the game is to assume the role of a superhero exclusively (i.e. not making an antihero decision at all), because I couldnâ€™t imagine the city would survive any longer with further corruption, and there were times where it really wouldnâ€™t make a difference whether I save Empire City or not. The milieu, as you described it, is confounding and uneven, and the emotions and the requests evinced by the hapless survivors were listless, passionate, or untenable in terms of their urgency and necessity. However, I would say that the design of the metropolis was believable enough; by the time I was accepting and undertaking strings of seemingly endless side quests, I found myself memorizing the locals and sceneries, and even when I wasnâ€™t paying attention to the radar, I somehow figured out where the park would be, given the construction of the city. Unfortunately, when I arrived to the second district of Empire City, I was completely overwhelmed by its sheer size and the prospect that I have to replicate my actions and â€œcleansingsâ€ all over again. I thought the first district was big enough and, with a bit of variety, it could have survived on its own. I guess what I am trying to say is that I wouldnâ€™t have minded the idea of a second (and a third) district if they were structurally different or multitudinous than the first, or at least had a completely different set of predicaments that needs to be resolved. Thus, unfortunately, my interest to revisit Empire City remains feeble at best; however, Iâ€™ll be keeping an open mind for the sequel and on the hope it would fare better than the first in terms of conception and gameplay. I thought the different islands were pretty varied. The second one especially had so many different and unique points like the huge tower, the prison and the shipping container yards. Especially when you think about it, they acted as the above ground dungeons. The third island was good too, mainly because it contained the blast zone. It was a return to the beginning in a way. If I was so inclined I could go point by point how Cole in another on of the faces in the hero’s journey. (He is.) I think the key wasn’t size so much as variety and the dissonance the world had with itself. I never played Infamous but I enjoyed your analysis just the same. I’ve only just discovered your site and I look forward to reading your insights.